The pass-catching Sternberger won’t be the first tight end drafted in 2019, but he could end up having the biggest influence. Jace Sternberger took the long road to the doorstep of the NFL. And now, a former overlooked recruit whose only FBS scholarship offers came from Kansas and New Mexico could push his way into the early rounds of the 2019 NFL Draft. Sternberger had to swap out three different uniforms — one Big 12, one JUCO, and finally one SEC — before emerging as one of the college game’s top tight ends. And while his average athleticism may keep him from being a Day 1 pick, his breakout season at Texas A&M could push him into the top half of the draft. In 2018, Sternberger was an unexpected game-changing star after hauling in 48 catches for 832 yards (second among FBS tight ends) and 10 touchdowns (first). A college career that began in Lawrence, Kansas, and detoured through Northeastern Oklahoma A&M ended with first-team All-American honors, ahead of likely first-round talents Noah Fant and T.J. Hockenson in the process. If his rise continues, he could wind up having a bigger impact than any other tight end to come out of 2019. Why is Sternberger a rising Day 2 pick? The simple explanation is that while his blocking is still a work in progress, he catches anything thrown into his vicinity. His wide frame allows him the leverage to box out defenders on shorter passes and create a big target for his quarterback, becoming an inaccurate Kellen Mond’s favorite playmaker and safety valve all at once. Questions about his blocking and athleticism will likely cap his climb at Day 2. Sternberger has a limited resume, and while he improved as a space-clearer for the Aggies’ running game as the season wore on, he’s still going to be playing catchup when it comes to stopping defensive ends and linebackers in the NFL. He doesn’t have top-line strength or lateral movement, and while he’ll still be effective when called on to break out and snuff out tacklers in the second level to free his tailbacks, he’s probably not going to be better than “average” in the trenches. A middling NFL Combine performance lends some credence to that theory. As fast as Sternberger looked at times on the field at A&M, his workout in Indianapolis was thoroughly average. His 4.75-second 40-yard dash time was 11th-best among tight ends and he failed to crack the top five at his position in any given drill. Since 2000, only six tight ends have run 4.75 or slower and still earned a spot in the first round. The good news for Sternberger is that the two members of that group closest to the A&M star’s measureables — Brandon Pettigrew and Heath Miller — went on to fulfill expectations for the teams that drafted them. The better news is neither of them had the numbers, particularly the big-play rate, Sternberger put together in an otherwise unimpressive Aggie passing offense. So why might the Patriots make sense for Sternberger? Fortunately for Sternberger, one man with a penchant for selecting slower, bruising pass catchers at tight end is Bill Belichick. Since 2000, Belichick has drafted (relatively) plodding hosses like Lee Smith, Ryan Izzo, Jabari Holloway, Spencer Nead, Dave Stachelski, and Arther Love. While players like Rob Gronkowski and Aaron Hernandez headline the veteran head coach’s class of tight end picks, he’s cut a wide swath through the NCAA’s available targets in his two decades at the helm. Now he’s got a glaring need at the position thanks to the retirement of Gronkowski and the release of Dwayne Allen. He’s also got five picks in the second and third rounds. That could mean a landing spot where Sternberger makes the enviable trade-in from bailing out an overwhelmed Mond to catching passes from Tom Brady, the most successful quarterback in NFL history. As @MikeGiardi said, Texas A&M tight end Jace Sternberger is one of a handful of draft prospects visiting the Patriots today. Sternberger (6-4, 251) led all TEs in TD catches (10) in ’18, while averaging 17.3 yards per catch. The Patriots are 1 of 9 teams he’s scheduled to visit. That’s no lock, or even an indication New England is definitely interested, however. Where Sternberger lands in this year’s draft is still very fluid. While the Iowa duo of Hockenson and Fant are unanimously the first two tight ends off the board (and almost always in the first round), who comes next is less predictable. Alabama’s Irv Smith Jr. is the most popular tight end to appear on mock drafts after them, but he’s merely the tip of the iceberg when it comes to useful blocking/receiving targets for 2019. That thick stack of prospects not only includes Sternberger but also Ole Miss’ Dawson Knox, Stanford’s Kaden Smith, and Utah State’s Dax Raymond. There’s no real consensus on the positional rankings after the Hawkeye duo, either. Sternberger doesn’t even appear on Mel Kiper’s top 10 list at tight end, but his No. 4 player, Boston College’s Tommy Sweeney, ranks 16th on CBS’s ratings. No one seems to know how this year’s crop of tight ends will turn out after Fant and Hockenson, which makes these pre-draft interviews and workouts immensely important for the rookies who will be selected on Days 2 and 3. 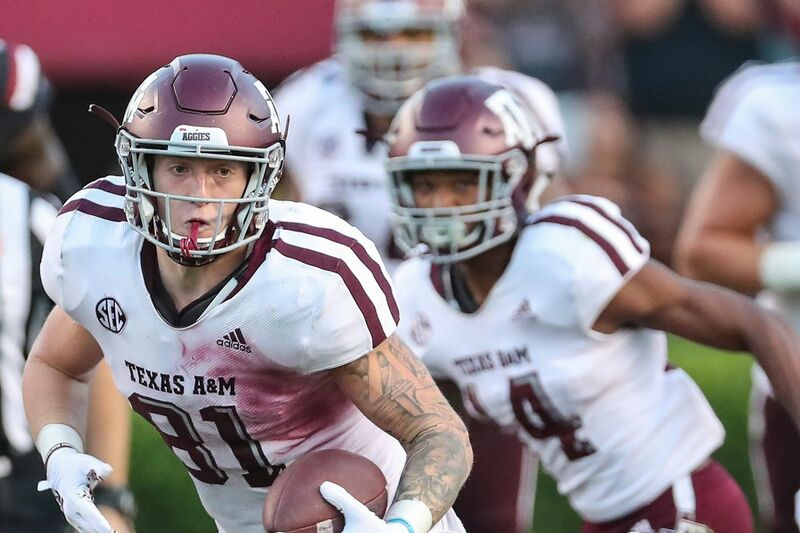 It’s been a busy several weeks for #TAMU speedy TE Jace Sternberger, who has had visits with 9 teams (#Packers, #Lions, #Vikings, #Patriots, #Bills, #Texans, #Seahawks, #49ers, and #Chiefs), while working out for 5 other teams (#Cowboys, #Saints, #Bengals, #Raiders, #Titans). Sternberger’s biggest mission in the weeks leading up to the 2019 NFL Draft will be convincing teams his 2018 was neither a fluke nor his ceiling as a player. He’ll also have to prove the speed he flashed on the field in College Station isn’t quantifiable by two days on the turf in Indianapolis. Acing those private workouts won’t push him ahead of Fant and Hockenson when the draft rolls around, but it could put him in a position to become 2019’s top tight end by the time his career is through. Copyright © 2017 Gow Media. SB Nation is a trademark of Vox Media.